Hi, If it’s against etiquette to post a similar problem here please let me know. I posted on an old thread earlier because of same subject matter and wasn’t told to make my own newer post . I have the same issue with not getting follow to work. I deviated from the subject of my other post and it was suggested to post my config in a more appropriate forum. Hopefully I did that correctly if not I will try again when I get home. P.S. i have also done something to my config that when I try to type in my password on log in only the letters are broadcast and I have to swap from window to window to type in the password. If it’s obvious could someone let me know how I might fix that? Re: posts. WE like people to create their own threads, as despite the problem seemingly being the same, it invariably is not. That said, if the problem is like 90% the same, then add to an existing thread. I'd say in this case, your issue is different, because it's a different game, and will probably have a different reason. Your issue with follow is that you have changed the Follow Me mapped key to call the wrong mapped key. This should also have no hotkey assigned (it is set on the mapped key in Base Hotkeys, and is SHIFT+0). And you have mapped keys in ISB42 - Combat Broadcast Hotkeys, which have the same hotkey as the hotkeys you are using for Follow and Assist. Assist will probably work as the default combat broadcast mapped keys will call Assist first anyway, and the timing might just work out, but Follow, might be triggering, but then breaking almost immediately. As a general rule, you should only have 1 mapped key with a specific hotkey combination, until you gain a bit more experience with the ISBoxer config and figure out what is active at and what is not. Currently all your mapped keys are active, and those with the same hotkeys will all trigger at the same time when the hotkey is pressed. 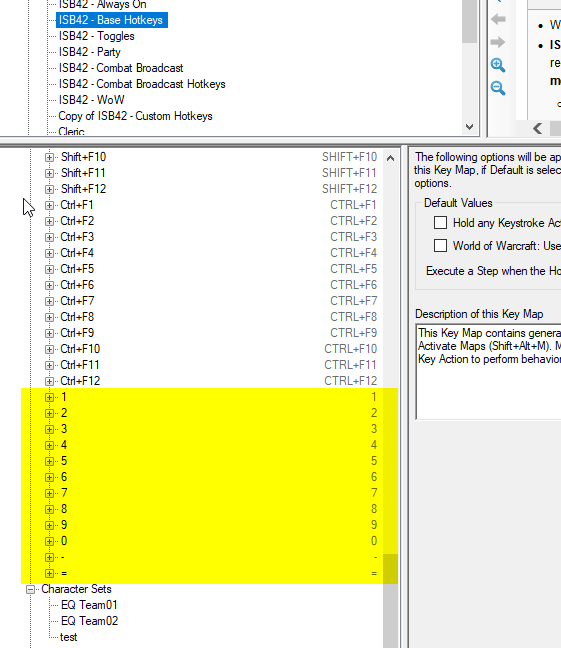 Should also note that setting up like that with hotkeys in the individual key maps, while not removing those hotkeys from the default key maps (or blacklisting those particular characters) will be potentially be troublesome in future, as the characters assigned to those key maps, also get the ISB2 - Combat Broadcast Hotkeys, by virtue of the Character Set AND being individually assigned (one or the other will do), and that Key Map also has ALT+1 to ALT+= so it is possible you'll get funny results with those particular hotkeys. You also have a load of mapped keys you've created in the Base Hotkeys key map, which, should be ok, except once again, there are mapped keys with the same hotkeys as other mapped keys in other keymaps, and they'll be active at the same time. These hotkeys are in use in the ISB42 - Combat Broadcast Hotkeys key map. TY will post new threads from now on. I will also fix the redundant key maps I have created when I get home. -I changed the follow me mapped key to active method. You will no doubt notice I finished setting up your more advanced healing clickbars, including using your hotkeys for the 3 different bars; mouse wheel up/down / mouse 1/2 . Do those have to match in game as well? I know in the simple guide left click would do simpleheal01 which was maped to hotkey 1, and right click would do simpleheal02 which was maped to hotkey 2. If I do need it to match to something in game then I know I have to change the choices. Sorry if I get the terminology wrong hopefully i'm getting my questions asked in a clear manner. I've sent alot of time trying to set this up and not much time playing, but I'm making progress. So no more issues ?? You can put mapped keys where you like, so Base Hotkeys is ok. Best to put them in something that has Hotkeys in the name, or put them in your custom key maps, and update the toggle so they can be enabled/disabled. They hotkeys for the healing bar key maps don't have to match anything in game, as the mouseover enables the key map, which turns on the hotkeys for those mapped keys, which could send anything to the game. 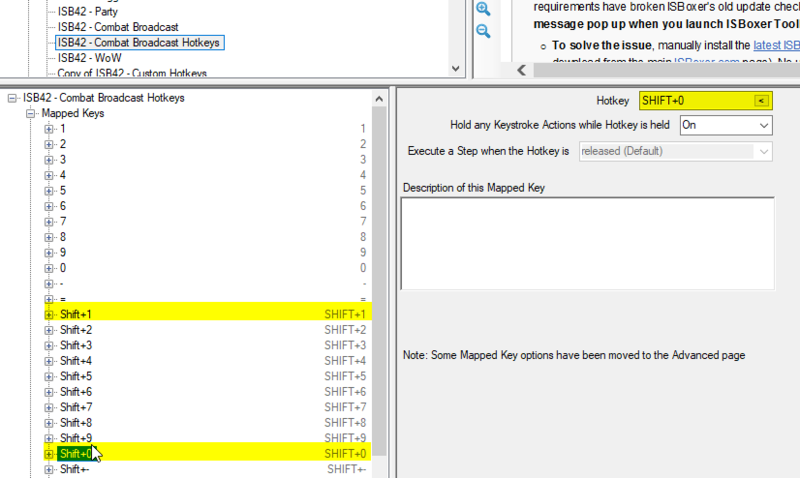 Trouble is, the hotkeys it enables, will need to not conflict with other hotkeys that are enabled elsewhere, so if you have hotkeys here that are used elsewhere, then you will want to have the mouseovers enable/disable the conflicting key maps. But certainly the mouse clicks/mousewheel options should work while hovered over the buttons. Except!, Your mouseover main healing bar mapped keys are not using the right action to turn on/off the key map. Should be Key Map State Actions, not Mapped Key State Actions. Sorry I guess my attempt at being clear would have been better had i remembered to give an update on any problems or resolved issues. So after the before mentioned changes at your suggestion, my follow me still was not working, it would get everyone to target me but no follow. After messing around with it I saw another post about follow / assist for EQ from Alge and so I changed "follow target / "assist target" to a CTRL+F1 / CTRL+F2 variable keystroke which matched to 2 socials I made in game connected to those hotkeys. Alas that still did not work either. For the click bars when I had main heal bar set up wrong, I tried changing hotkeys to 1-4 but then everyone was casting 1, 2, 3, or 4 no matter what button I was scrolled over. So I thought I must have "1 - =" broadcasting to everyone. So i changed it to Num1-4 and tried hitting Num1-4 while moused over the buttons but nothing was happening. So now I've reverted back to your mouse up / dn / 1 / 2 mapped keys, and keybinds. When I scroll over and hit the hotkeys i get the message to match the hotkey and mapped key slot i.e. Left Click Buff, Right Click Main etc. But it doesn't actually do anything I have a feeling I'm suppposed to link those hotkeys to something else to make something happen. I deleted my old healing click bar from my config along with my attempts at a mez bar so that now all I have is the one I set up through your more advanced guide, but for some reason all the other click bars still show up when I log on and I have to go through and turn them off. And my new healing clickbar only shows up on my tank when I launch, does it matter if I don't hit save "auto" on every window? rollin772 wrote: After messing around with it I saw another post about follow / assist for EQ from Alge and so I changed "follow target / "assist target" to a CTRL+F1 / CTRL+F2 variable keystroke which matched to 2 socials I made in game connected to those hotkeys. Alas that still did not work either. Try using ingame binds without modifiers, and set the Social accordingly. Pretty sure that EQ is not keen on reading the modifiers properly for the Target Slot/Follow Target method. Unfortunately the workaround method to follow in EQ is long and convoluted. If nothing else, it would show whether it was working properly or not, so determines where the focus needs to be applied. rollin772 wrote: But it doesn't actually do anything I have a feeling I'm suppposed to link those hotkeys to something else to make something happen. Quite right, you should have the mapped keys send something to the game, with the target you want to do that thing (like the Healer group), so they do something, like heal the targeted toon. Not sure. You can delete the Clickbars.xml files from the InnerSpace\Scripts folder, and then rexport from the Toolkit, and this should stop. Sounds like something is not being cleared on export. This sounds like a whole new issue, and rather strange. On export ISBoxer will reset the graphics window (or something along those lines), which might make it do strange things, but it is unusual. Might be compatibility diagnostic time.